A laptop with a modern, edgy "wallpaper" pattern. 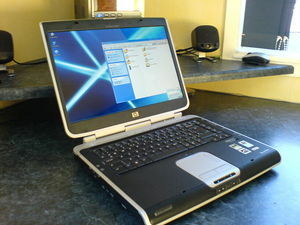 Laptop computers, or laptops for short, are a variety of computer often brought to schools, offices, and libraries. They can even be used in cramped motel rooms when no other entertainment is available. Laptops were invented with schools in mind, to remove one alternative to doing actual schoolwork. 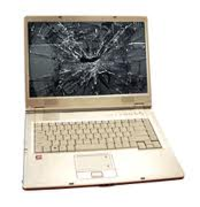 Advocates of laptops (primarily school employees and laptop manufacturers) pass them off as convenient replacements for desktop computers, citing the greater ease of transporting them due to their ability to fold up into a small size. This neatly glosses over their inconveniences, each of which outweighs the supposed convenience. Touchpads replace conventional mice but add 'selective sensitivity', which is akin to selective deafness. They are most responsive when it is least intended. Clicking on something usually has no effect, but accidentally resting your hand on it makes the cursor jump around excitedly and may defragment the system disk. Touchpads thus respond not only to touch, but read your mind. Laptop screens are just big enough to awkwardly display a single browser window. Restricting the number of windows that fit on a screen forces the user to concentrate on the window relating to schoolwork and not open extra windows that probably concern gaming and YouTube. Keyboards, like touchpads, are unresponsive to touch, though unlike touchpads, they do not get more responsive when pressed by accident. Keyboards are deliberately 'sticky' to make it harder to type. (Some keyboards are sticky even before a can of Coca-Cola is spilt on them.) Causing work to take longer uses up leftover time that could have been used frivolously, and also discourages frivolous computing. Laptops were originally an ingenious conspiracy of a school system out not to educate children but to keep them from having fun, and computer companies eager to translate any such impulse into a profit. Disallowing fun was supposed to teach students the communist values of sharing and self-sacrifice. What it actually taught them was that the most fun could be had beating laptops with a sharp implement. That, and the demise of the Soviet Union, led school boards to quietly start using laptops for a different purpose, kept under wraps to not pour too much petrol on the flames of the Red Scare. Nowadays, many schools use laptops simply because it has become a tradition, without giving any thought to their real purpose, never mind the associated features; and they are surprised when students attempt to circumvent those features. Star Trek proposed that, in the year 2380, laptop use would become widespread, but floppy disks would get huge. Just as airplanes began as military devices and were eventually adapted for civilian usage, so laptops were eventually adapted for none other than their stated purpose--to be convenient replacements for desktop computers. The laptops in personal use are rather less inconvenient than school laptops; notably, the screens are larger and and the touchpad can be turned off and replaced with a mouse. They still retain some holdovers from the original kind, but overall they are more convincing and have contributed heavily to the notion that laptops are in some way easier to use than the alternative. ↑ If anyone complained that school wasn't fun, they were reminded that children are starving in Africa. This argument was supposed to prove that, since 'it could be worse', hoping for anything better was selfish. This page was last edited on 1 June 2018, at 07:15.